The OMYL-M32 voltage data logger has two channels for recording extra-low voltage levels in the millivolt region (±5 mV, ±10 mV, ±20 mV, ±50 mV, ±100 mV, +-1000 mV) and also common reference voltage measurements, e.g. standard analog outputs (0 to 1 V, 0 to 5 V, 0 to 10 V). This data logger is available with standard memory of 100,000 readings (OMYL-M32) or expanded memory of 4 million readings (OMYL-M32-4M). Both models can be used for recording small measurement signals from a Wheatstone bridge, force or range sensor, strain gauge, or other extra-low voltages applications. 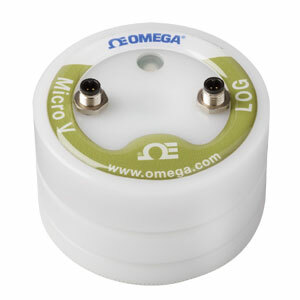 This data logger provides constant bridge excitation current for strain gauge sensors. These devices are programmable so that you can log data from either one or two channels. Both models feature a 20 bit analog to digital converter giving a resolution of up to 0.15 μV. The data logger’s measuring range is user-selectable, enabling you to work with measuring ranges from 10 mV to 20 mV at the same resolution. Nota: Comes complete with OMYL-CU and OMYL-CS voltage input connection cables, OMYL-SOFT software, 3V lithium battery (standard temperature range), 1.8 m (6') USB interface cable and software and operator’s manual on USB stick.